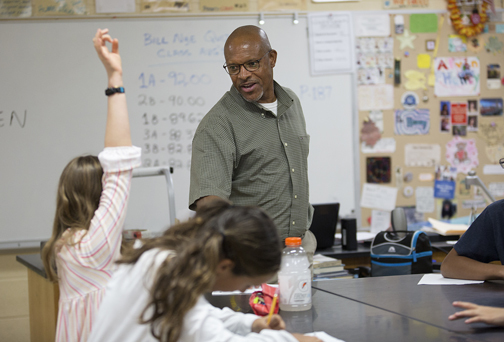 Alvin Haney interacts with his first period science class before they prepare for a test at Meigs Magnet Middle School. The country’s teachers are largely female, according to research released last year by the National Center for Educational Statistics and the U.S. Department of Education, and overwhelmingly white. The 2015-16 survey finds about 77 percent of teachers are women. In primary schools, nearly 9 in 10 teachers are women. In high schools, only about a third of the teachers are male. Plus, about 80 percent of teachers are white, while 9 percent are Hispanic, 7 percent are black and 2 percent are Asian. Haney says for many of his students he is the first black male teacher they have ever had and recognizes the importance that they see him in a position leading a classroom, where they’ve mostly seen females in that job. “I really think it’s important that they see a black male teacher, that they see me in a role where I’m leading a classroom, being able to show them that the images that they’ve seen in social media and the public and on TV, are black males doing anything other than being in the classroom,” Haney points out. Haney’s family moved to Nashville when he was in the second grade, and he went through the Metro Nashville Public Schools system, attending Eakin, Head, Washington, West End, Pearl High School before it became Pearl-Cohn. He then graduated from Hillsboro High School in 1983. He earned a biology degree at Tennessee State University and become an educator, though he was originally thinking about pre-med. His parents suggested he take some teacher education classes to see if he liked it. “I started taking those along with my science curriculum, and decided that’s the way I want to go. I just really fell in love with it,” Haney says. Since his career choice was supported by his parents, it made a big impact on his decision to go into teaching. It helps that they were both in education. His dad was a college history professor who taught at Vanderbilt and TSU, and his mom was a high school biology teacher before switching to a career in publishing. His sister is also a teacher. But being like dad is a reason many boys do not go into teaching. Ben Diles recently started his 21st year teaching at Columbia Academy, his first job out of college. Originally from central Arkansas, he went to Harding University in Searcy, Arkansas, when reps from Columbia came there looking for teachers that share the same denominational affiliation. He teaches senior Bible and supervises spiritual development, but over the years has taught AP U.S. history, world history, and geography. He also has coached football. Diles originally went to college wanting to be an attorney. That changed as he thought about the possibility of defending people if it went against his beliefs. Diles also had the benefit of educators in his family which helps mitigate stigmas about male teachers. Both of his uncles were school administrators, his mom was a teacher and his grandfather was a high school superintendent and principal. “It’s been in my family for two or three generations now,” he adds. But that doesn’t mean Diles has not felt the stigma surrounding male teachers, even from his own father. Diles’ dad was a lineman for an Arkansas power company. In that line of work, Diles says there was some disdain for people who were not blue collar. 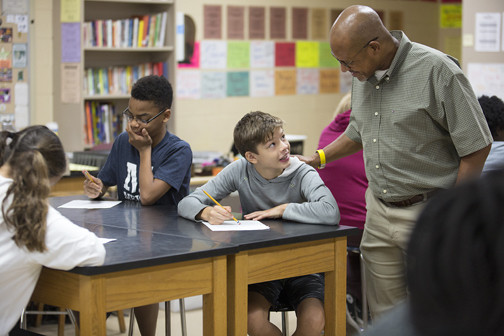 A K-12 school in Maury County, Columbia Academy has few male teachers. Diles says the entire time he has been at the school, there has only been one male teacher for K-6, the PE teacher. By middle school the mix is closer to 50/50. But of those men, almost all of them also coach. “I haven’t worked with many male teachers that haven’t coached,” he says. Diles contends the shortage of male teachers has something to do with the lack of value society places on teachers in general, and male teachers especially. Salary and the deeply-rooted mindset that teaching is a woman’s job are some of the issues, especially in the lower grades. Ethan A. Zagore, director of the educational talent search TRiO program at the University of Notre Dame, says a combination of strategically intentional actions and a change in perception are both necessary in order to shift the mindset and get more men in the classroom. “A gradual increase in elementary teacher salaries would be an excellent first step,” he says. “Elementary school teachers must be compensated to reflect their impact on a student’s academic future, which is often related to their financial future. Zagore says of equal importance, postsecondary institutions must serve as a liaison between male high school upperclassmen with the passion and ability to teach, and the actual elementary classroom, where these same male students can change lives after graduating from college. Hillary Tubin, founder of Boy-Responsive Literacy Consulting, LLC and the author of “Boys and Books: What You Need to Know and Do So Your 9- to 14-Year-Old-Son Will Read,’’ has a mission to help parents and educators reshape reading and show them how to become the reading role models boys need. And, she says, it can help create male teachers. With more male teachers in a school, Tubin says boys would see first-hand men reading aloud to their students, hear men talking about books, and have men recommend books on a daily basis. “This would then help boys realize that reading isn’t just for girls, it’s for them too. Only when that happens will the reading gender gap between boys and girls close,” she says. “As for why there is a shortage, I believe it’s the same reason why boys don’t think reading is for them: gender stereotyping. As society shifts, Diles says men in positive roles are more valuable, perhaps now more than ever. Dr. David Hough, dean of the College of Education at Missouri State University, is an expert in K-12 education and says research clearly documents positive outcomes for children when fathers who are good role models are a part of the family unit. Hough says an adult male’s influence can be positive when the role model demonstrates positive character traits. Children tend to mimic or “act out” the behaviors they see. In schools, male children may benefit from male teachers by observing appropriate behaviors, most notably associated with how to handle anger, respect for others, and rule following.